Sugaman tours is a tourist agency from Split which started its tours program with Blue Cave and Hvar tour. Our experience and knowledge of all the secret little spots along the tour makes this tour an experience you don’t want to miss. With the office inside the Diocletian Palace located in Dosud 4 street, your departure point for the tour is only a short distance away taking you through Splits famous promenade to the pier on Matejuska. You will be welcomed by enthusiastic and professional staff and the speedboat crew who will stand at your disposal throughout the day revealing all the interesting spots you will visit on this tour. You will find that your good time, mutual understanding and communication is at the top of our priority list. We cherish the opportunity to present our beautiful country to you with its hospitable people, tradition and unparalleled natural beauty so that you can create lasting memories of the time you have spent with us. 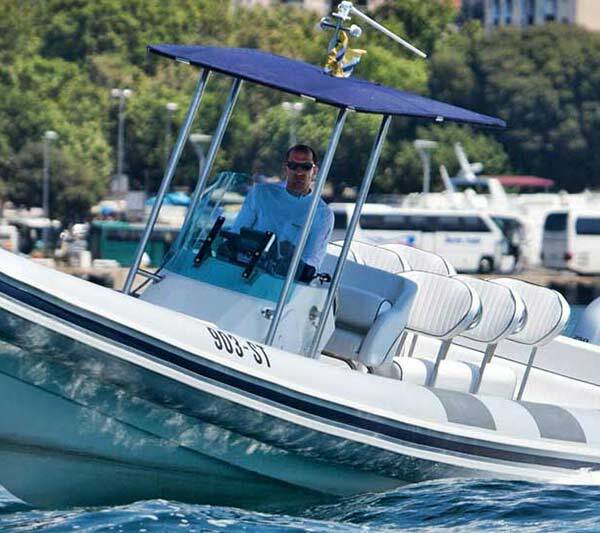 Our speedboats are top quality rigid inflatable boats (RIB) with 250 horse power engines making them speed across Split channel with ease. On our speedboats we provide life vests and waterproof jackets. You will also have free Wi-Fi access on our speedboats during entire tour. If you have chosen Split as your vacation destination for the summer Sugaman tours is a one shop stop for all your excursion and transportation needs. Besides shore excursions we also provide tours to national parks (Krka and Plitvice) and city break to Dubrovnik in our luxury air-conditioned mini-buses each providing free Wi-Fi access. Rafting, canyoning, cannoeing, fishing, climbing… just contact us or come by to our office and we will reveal all that Split has to offer to you.